This is an awesome site. They breed Cats. No broken Links, Graphics and Pics of the Cats that they breed are awesome.Just Beautiful.Thank you and congratulations! 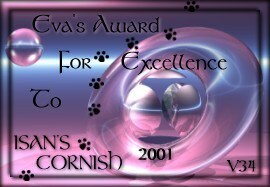 This award is given to business websites, like yours, that has outstanding content and design. Your site has met our criteria to win the business award, with it's great graphics, organization, no broken links and educational content. Congratulations you have won my Award for Week 34. Your cats are so sweet. A very nice site, good design, clever graphics, great photos, and you have provided your visitors with content that is informative, entertaining, presented well and easy to access. A worthy tribute and a positive contribution to the Web.